B/R International's solvent recyclers are designed to turn waste solvents into pure recycled solvent. 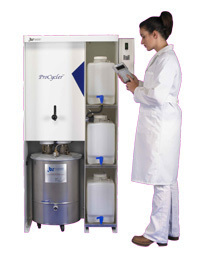 Save money on new solvent purchases and waste disposal. Pure Recycled Solvents: B/R solvent recyclers use fractional distillation to remove contaminants from waste solvent. Recycled solvent is as pure as new solvent. Solvents can be used over and over again without any degradation. Easy to use: Computer control fully automates the distillation process from beginning to end, minimizing the time needed to operate the equipment. The recycling process is fully automated from beginning to end. Put your waste solvent in the solvent recycler and push start. The solvent recycler does the rest automatically. The solvent recycler will let you know when the recycling process is finished and will shut itself down automatically. Safe: Automatic control constantly monitors the solvent recycling process and shuts it down in case any problems are found. Recyclers carry ETL, CSA and CE safety approvals, so you can be confident that all safety regulations are met. Safety options such as vapor sensors are available for an additional margin of safety .